February | 2014 | The Glyn Watkins Show Page. The 9th annual celebration of the saint of forgotten Valentine’s, inc. some joys of Clerkenwell! I never thought that a poetry show could be so action-packed and so funny. A very enjoyable evening. I cannot make it to the Great Event… I wanted to wish you well with it and thank you for the splendid ‘Walburgas’. 8.00 pm. Mon. 24th Feb.
Every 20 mins or so. from 8pm. for as long as he lasts (Books sold & arts subsidies accepted). Next show, 24th Feb. Jerusalem Tavern. 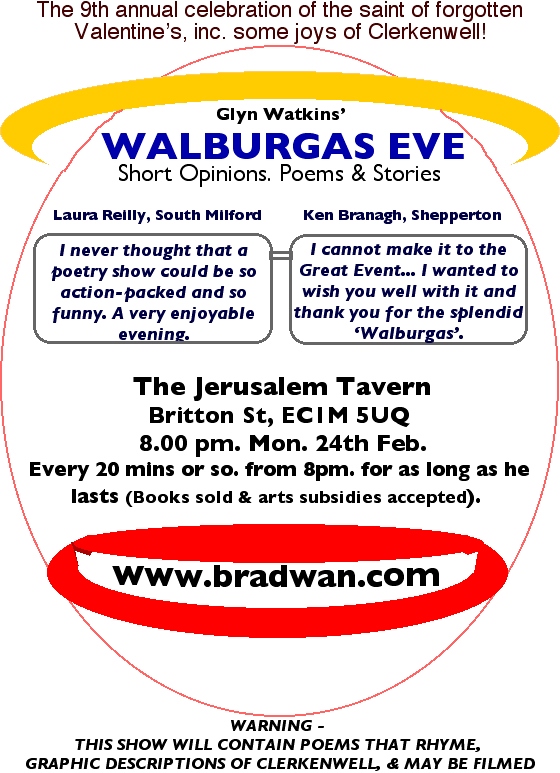 The next show should now be the Walburgas Eve Show (celebrating the patron saint of forgotten valentaines) on Monday 24th February at the Jerusalem Tavern, Britton Street, Clerkenwell. The start time should be 20.00. though that needs to be confirmed, and will be soon. It will probably follow the format of my triumphant (no violence was offered and everyone I heard said they enjoyed it) Burns Night show. Bright St. Blaise Events Shine! This year’s celebration of Bishop Blaise, Bradford’s forgotten saint, has been declared the best in modern times by organisers, after a walk and two events showed off some of Bradford’s hidden past. Saint Blaise was the patron saint of woolcombers, and until 1825 the woolcombers of Bradford would organise a massive procession to celebrate Blaise and all of the wool trade, from shepherds to merchants. There were also shows at Glyde House on the Sunday and Bradford University’s Theatre in the Mill on the Monday (St. Blaise’s actual day) which featured different stories and pictures from Bradford’s rich and diverse past. In them may our community – Join hands and thus increase. 1. 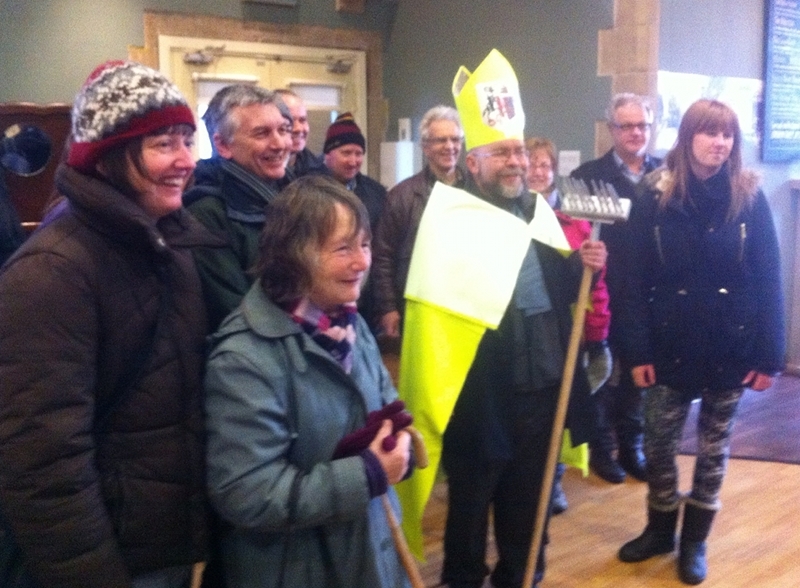 Glyn Watkins dressed as a bright Bishop Blaise, complete with woolcomb, with some of the happy walkers about to set of from Glyde Hose. Fiona Horner of Sowerby Bridge and Mary Loy of Wibsey closest to camera.